Get Your 5 FREE Raffle Tickets Here! 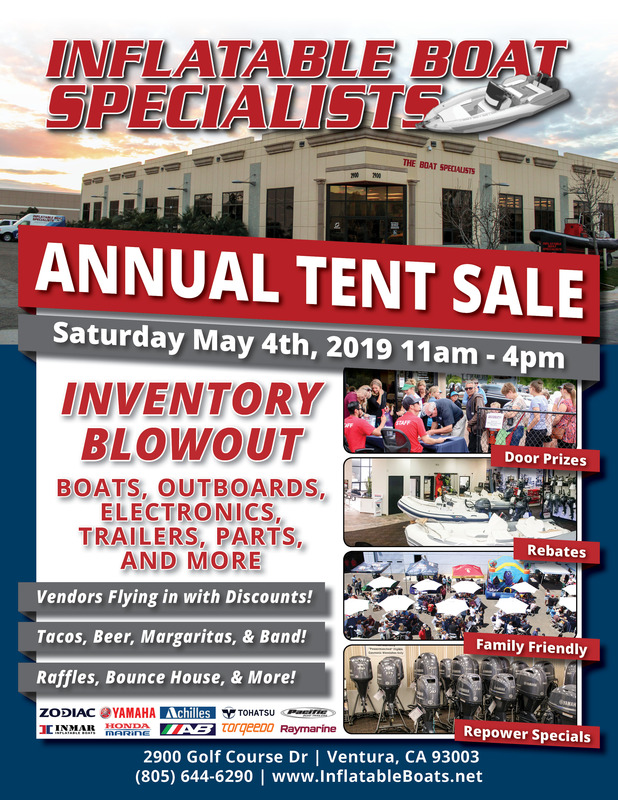 Inflatable Boat Specialists is holding our annual Tent Sale on May 4th from 11am to 4pm at our dealership in Ventura, CA. We will have Free Tacos, Free Beer, Free Margaritas, Live Music, Raffle Giveaways (LOTS of great prizes.... even a Rigid Boat! ), and many marine industry vendors on-site with BIG, once-a-year discounts and rebates. If you need to purchase an inflatable or an outboard, this INVENTORY BLOWOUT is the DAY to come see us. There will be a play area for the kids so bring the whole family for a great time and great deals! Must be present to win prizes!